Boggs Ramblings and Post Mortem. Last week someone offered me free entry into a race near Clearlake, CA at a great park called Boggs. I’d been thinking of going to the race and getting the free entry sort of tipped me over the edge. The race is a 24 hour endurance race.Â I did a solo entry and figured on taking it easy and just seeing how many laps I could in 24 hours. Never really thinking in terms of it being a “race” more just an endurance event.Â I started out at a fairly moderate pace. The first lap was a pokey 1:12 minute pace. Between laps I recharged my nutrition and did a little tuning of the bike. The second lap was more fun than the first. Folks were spread out and I was rolling at a good pace and chatting with other racers. Nearing the end of the lap, there is a long climb then a really fun section of singletrack. It’s not very challenging, in fact I often recommend it for beginning riders. It’s called Gail’s trail. Primarily just fast, smooth rolling trail with occasional easy to avoid rocks or trees. The only tricky bit about Gail’s trail is the fact that the edges are soft and covered with slippery pine needles. I was cruising down Gail’s at a good clip, really enjoying myself. I’d just passed someone and the fun meter was set to about 8, then my front wheel found those pine needles. Usually time sort of slows during a crash. Every little detail pops out larger than life. It seems like you could pick out even individual dust motes as they slowly drift by… this time there was nothing. I went from flying down the trail to being on the ground in pain in an instant. There was no realization of impending disaster. In fact there was no post fall tumbling, no bouncing or sliding down the hill, just an instant stop. Forward motion was transmuted into one glorious rush to the dirt. Thump!!! A couple of riders caught up to me almost immediately. I was alert and didn’t feel too bad. One says “Hold on, make sure everything is ok before you try and get up.” The thing is he didn’t have to say it. I knew I couldn’t move… I tried to move my leg, but my body rebelled. Even as my brain sent its little messages to my leg, it refused to cooperate. There was a little pain then but it wasn’t bad, sort of a dull throb, but nothing telling me how bad things were. Someone moved my bike and I tried to work out what I needed to do to get off that blissfully fun/ fast section of trail where riders were showing up by the minute at high speed… I tried some things, scootching a little but my leg had greater wisdom than my brain and it refused to cooperate. For the next 45 minutes, I lay sprawled across the race course, riders rolling up, many of them skidding to a stop. Collette and another campsite buddy Matt waving their arms stopping people from rolling right over the top of me. I’ve been in the mountain biking community long enough that I recognized many of them. Heck, I joked with them. What do you say when someone says “Are you Ok?” when I’m 3MM from pure agony. The EMT along with Jim Northey, the race promoter show up and they assess the situation. I’m right smack in the middle of a long section of singletrack. It’s too tight to get a quad in safely and there is no way they could walk me out so Jim arranges for a stretcher evac. After a little more waiting, my chariot arrives, a 6′ long piece of plastic, with the other EMT and a couple stretcher bearers… It took them another 45 minutes to an hour to get me to the truck. A relatively short, bumpy ride down the dirt road in the back of a pickup. I get to the heliport where an ambulance awaits my extraction to the hospital. The crash was around 2PM. By the time I arrived at the hospital, it was some time around 6:30PM. I want to thank everyone involved in extracting me from the scene. Everyone was professional and tolerant of my tasteless humor and occasional ribbing. The EMT who shared the ride with me also happened to be a mountain biker which I thought was cool. By the time I was at the hospital, the more or less non-stop jossling had caught up with me. My leg was in pretty constant pain and I could no longer find that magic spot where the pain was minor. The ER doctor arrives shortly after IÂ do and asks me the same questions I’d answered a dozen times already. Some time later, after a few more of those very painful and traumatic moments, I am all X-rayed up and prepped for surgery. I don’t remember much about the surgery other than making a few jokes in the prep room and that one final “*****GAAAAAAAAHHHH!!!!! ******” instant of pain which the anesthesia didn’t cover. Then lights out. When I woke up the difference was nearly miraculous… sure I was in nearly constant pain. My leg also had a few positions which caused me to nearly black out in pain. But somehow I could feel that things were better. The nursing staff were great and really tolerant of what had to be a horrible patient. However by Sunday afternoon I was able to get out of bed and use the little boys room all by myself. I nearly floored the nursing staff when I got on a walker and managed to hobble down to the nursing station and asked to be pushed outside to enjoy the cool and sun for a bit. The rest of my day was spent pretty baked on a morphine derivative which was quite enjoyable. Monday morning I got up early and stole a wheelchair. For some reason sleep escaped me. Counter to my normal routine, I was up and active at 5am. My goal was to get out of the hostpital that afternoon or maybe morning so I had the nurse pull my IV and give me a few Percoset. I rolled out the front door to the hospital and enjoyed a brisk sunrise over Clearlake. Hey Ogie! Wow… …you’re crazy! Now that I have the whole story I have to say I’m pretty impressed… …except with the part where you bit it on GAILS… …of all places! Lol. Well, at least it was free entry. wow…sure glad you’re ok. hope you get back on the trails soon. Sorry to hear about the crash my friend. Keep your spirits up. Hey, I’ve followed your site for a few years now. This is the first I’ve checked back in over a year. 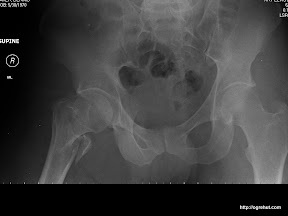 I too broke my hip in Sept of 08 on Mt Diablo, probably Karma as I was poaching a section near Rock City. Nonetheless, your experience mirrors my own, including denial that it was broke and I was still going to make it to Downieville the following weekend. I can still hear the X-ray technicians in the back room with a quiet but somber “ooooooohh, wow”, door closed on riding anytime soon. Here are just a few picts (http://www.facebook.com/album.php?aid=2008948). I still get squeamish looking at the post surgery X-Rays in all their titanium glory (permanent rod, pin, and screws). Needless to say, I am back on the bike, I’ve aquired a singlespeed, and am slightly more focused on various rides. I ride with a pair of Fox Launch Padded Shorts full time, and have 90% mobility back. Although, that day your children can outrun you in a foot race has come sooner than expected.